Water resources are sources of water that are useful or potentially useful. Uses of water include agricultural, industrial, household, recreational and environmental activities. The majority of human uses require fresh water. 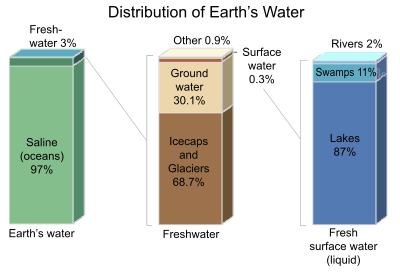 97 percent of the water on the Earth is salt water and only three percent is fresh water; slightly over two thirds of this is frozen in glaciers and polar ice caps.The remaining unfrozen freshwater is found mainly as groundwater, with only a small fraction present above ground or in the air.